Posted on July 29, 2010 at 16:43. My lastest visit to Kyiv, but hopefully not my last, was in January-February this year. Cold and dark, but even so, more nice, warm and friendly. Hopefully these pictures can share some of those feelings. Posted on July 20, 2010 at 09:57. These pictures was taken during one of my visits to Kyiv. It is one of my own favorite albums, possibly because somebody managed to capture my face and because there are many faces in this set that I like. But even so, there are many faces I miss too. I have promised myself to try to be better in taking photos of friends. But still I am far too shy for that. Posted on July 18, 2010 at 14:08. The shameful treatment of Ukrainians by the Schengen and UK visa systems continues to hit new heights, with at least two more atrocious stories emerging this week. The UK’s Independent highlighted the rejections of visas for Ukrainian children who were due to spend a month away from the vicinity of Chernobyl. Whether these trips are healthwise still strictly necessary is open to question, but the point is that these summer trips have gone on for years without any problems. In just one example, only 7 out of 17 children due to spend part of the summer on the Isle of Wight were permitted to travel and, to make matters worse, they were in some cases informed only the night before travelling, with suitcases packed, that they would not be making the trip. The UK Border Agency tried to blame it on unsuitable host families in the UK, but the claims seem to be spurious. Photo from Chernobyl by Pedro Moura Pinheiro. Another case highlighted this week was of two PhD students bound for Italy who had their student visas rejected. There is an exhaustive list of similar cases, including the Ukrainian dance troupe which protested against their UK visa rejections by performing outside the British Embassy in Kiev. A folk festival in Bellingham had been deprived of the same pleasure. A recent article in the Kyiv Post highlighted an unfortunate Ukrainian student’s extended stay in the departure lounge of Paris Charles de Gaulle airport due to the Icelandic volcano. The fact that he had friends in nearby Paris and was on a US student visa cut no ice with the French authorities despite clear evidence in favour of the applicant. Another case brought to my attention by my father was a group of Ukrainian steam train operators which was prevented from attending a gathering of railway preservationist organisations in Hungary. The gathering was part of the process of trying to bring Ukrainians round to creating the kind of railway preservation projects which have grown tourism in myriad places across the continent. Such developments are fairly alien in somewhere like Ukraine, but these are good examples of how visa rejections will serve to reinforce the status quo. One not to be ignored result of this policy is the stress that it has caused to EU citizens in each case. With cases of a more personal nature this stress is amplified. In such cases the inviting party is treated as irrelevant to the matter in hand or even worse, de facto made out to be liars. These rejections are damaging business, cultural, educational, family and personal contacts of EU citizens. Don’t we have rights too? With the common thread here seeming to be the apparently arbitrary nature of many visa rejections, does it smack of conspiracy theories to begin to question whether there is a more sinister motive at work here? Are the EU and UK in fact telling Ukrainians in fairly blunt terms to ‘go back to Russia’? The line has been drawn and, sorry, you’re on the Moscow side. If this is not the message they wish to give out, they’re not doing a very good job! This was previously published at Chicken in Kiev. Jonathan Hibberd recently completed post-graduate studies at Sussex European Institute, University of Sussex in the UK and has carried out research into questions of Ukraine’s European integration and the country’s relationship with NATO. He currently works with the British Council in Kiev. Posted on July 17, 2010 at 17:08. These photos from Moscow in April 2008 are perhaps my own favourites. Possibly because this was the first time I used Ilford b/w 3200 and I was very stunned by the grain and the mystery the pictures got through using that film. Posted on July 14, 2010 at 09:59. Posted on July 10, 2010 at 16:58.
viewpoint-east.org will take a break during July and parts of August. I will however publish some photo sets from Moscow and Kyiv during the summer, and I aslo welcome new articles, picture etc. So contact me if you have any up your sleeve you’d like to publish at viewpoint-east.org. I will move to Lviv in September and hope to be able to publish a lot of fresh and entertaining posts, such as I hope viewpoint-east.org will get a lot of new collaborators in the future! Posted on July 1, 2010 at 15:17. When I was in Kyiv in January and February I meet several that said they had identified one very important lack in the Ukrainian domestic debate and that is the lack of left wing intellectuals. I must say I agreed fully since we do need a criticisms of liberal values, capitalism as a guarantee of democracy, the concepts like democracy etc. I can’t value wheather it is the recipe on a “good debate climate” but at least I can see the world (Western, Eastern, Northern, Southern, in actually all directions) has been living in a sort of liberal “dictatorship” for far too long. It is possible that I have a very simplistic understanding of what Ukraine needs, but at least I can see that the country need something to make the debate more vivid and productive. Furthermore, when I was in Moscow a couple of months later I heard the same point of view, what Russia need is left wing intellectuals that stands in contrast towards Kremlin and the political establishment. But it was not until the other week, when somebody wrote on my chat that Ukraine need left wing intellectuals like you have in Europe I started to feel that something was nagging me, because I answered Yeah, yeah. 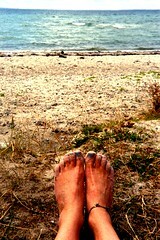 But this is Scandinavia, and tried to forget about it. But I couldn’t since I stumbled over my irritation over and over again. It was not until this morning, when I read a review of Burnt by the sun 2 by Nikita Mikhalkov in the independent, but rather left wing, weekly newspaper Fria Tidning that I understood how I was irritated. The newspaper is not said to be left wing, but most of the articles printed there have a rather left wing approach towards different issues. I think that is a good thing, even though the political consensus in it really can make me feel sick some times. Back to the review. I must begin with giving the author, Per Leander, credits for making the effort to write a review that is not pointing in the same direction as all other previous reviews of the movie. Mikhalkov has gone from being the Western Europe’s favourite director (by Burnt by the sun in 1994), to become one of the least popular such during the last couple of years. Most critics uses the same kind of words about his latest work, such as a patriot and nationalistic director with simplistic rhetoric that uses the Kremlin to authorize his expensive and vulgar movies. The two first remarks is perhaps indisputable, which is perhaps the reason why it is not mentioned in the review. However, to criticize a Russian director, that was formally exalted hero, can provoke Swedish left wing because he is, yes, Russian and from the Former Soviet Union. The review in Fria Tidning is a very good example on just that. 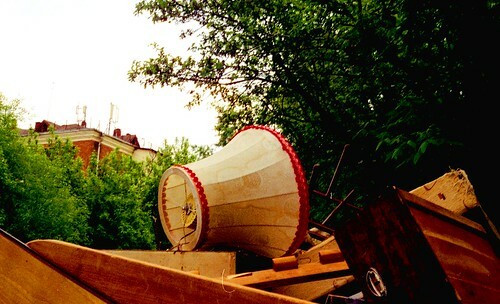 Old Soviet style furniture thrown away in Moscow, May 2010. An other point is that the author criticizes the Western movie critics because they are not able to understand everything in Russian culture history and cannot understand the all paraphrases. It is interesting to see once again that a Swedish left wing movie critics actually uses the exact way of mechanism to exclusion such as Russian nationalists do. “You will never understand this because you are not Russian”. But in what sense does this make it a better movie? In my mind many references does not make a movie better, that’s all. It could actually be very contra-productive! The last point is perhaps a stupid remark form my side, but I just can’t let it be. It is about Nikita Mikhalkov’s “great knowledge in music”. The author bases on the fact that he is the son of Sergey Mikhalkov that wrote the Soviet Anthem (Eh, I feel lost already). Mikhalkov JR reveals this great knowledge in music in using the titel of a very popular tune from the 1930s, a Polish tango. That is like saying that I have a lot of knowledge in the 1960s because I can sing “She loves me, yeah, yeah”! This review is merely an example that i wanted to take to illustrate what I find problematic with the stand point that many Swedish left wing intellectuals have. My point is that a left wing intellectual movement or group is perhaps needed, but if it embraces Soviet Union and Stalinism (which is shown in the above mentioned review), just to be on contrast toward liberalism and capitalism, well, then you have a problem. I think it is rather fair to criticizes Mikhalkov and his movies. He is using his power in the Russian Cinematographers’ Union as much as possible, by giving himself money and excluding others. This is not mentioned even by one word in the review, which is very odd since there were a big crisis in April 2010 when many directors and filmmakers left the union in protest against Mikhalkov’s way of ruling the union! In some odd way many leftist intellectuals in Sweden have found it important to defend old power structures in Russia and countries in the former Soviet Union. I understand it is a way of criticizing liberalism, but from my point of view it is the wrong way! I would like to conclude by saying that I am pretty sure that Swedish left wing intellectuals will change and stop trying to defend old nomenclatura, when they meet the newly born such movements in Ukraine and Russia. And I do hope this moment will come as soon as possible.